What treatments are available for TMD? Temporomandibular disorders (TMD) occur as a result of problems with the jaw, jaw joint and surrounding facial muscles that control chewing and moving the jaw. 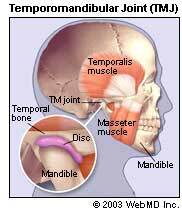 The temporomandibular joint is the hinge joint that connects the lower jaw (mandible) to the temporal bone of the skull, which is immediately in front of the ear on each side of your head. The joints are flexible, allowing the jaw to move smoothly up and down and side to side and enabling you to talk, chew, and yawn. Muscles attached to and surrounding the jaw joint control its position and movement. The cause of TMD is not clear, but dentists believe that symptoms arise from problems with the muscles of the jaw or with the parts of the joint itself. People with TMD can experience severe pain and discomfort that can be temporary or last for many years. More women than men experience TMD and TMD is seen most commonly in people between the ages of 20 and 40. Other common symptoms include toothaches, headaches, neckaches, dizziness, and earaches and hearing problems. Because many other conditions can cause similar symptoms ? including a toothache , sinus problems, arthritis, or gum disease ? your dentist will conduct a careful patient history and clinical examination to determine the cause of your symptoms. He or she will examine your temporomandibular joints for pain or tenderness; listen for clicking, popping or grating sounds during jaw movement; look for limited motion or locking of the jaw while opening or closing the mouth; and examine bite and facial muscle function. Sometimes panoramic x-rays will be taken. These full face x-rays allow your dentist to view the entire jaws, TMJ, and teeth to make sure other problems aren't causing the symptoms. Sometimes other imaging tests, such as magnetic resonance imaging (MRI) or a computer tomography (CT), are needed. The MRI views the soft tissue such as the TMJ disc to see if it is in the proper position as the jaw moves. A CT scan helps view the bony detail of the joint. Treatments range from simple self-care practices and conservative treatments to injections and open surgery. Most experts agree that treatment should begin with conservative, nonsurgical therapies first, with surgery left as the last resort. Many of the treatments listed below often work best when used in combination. Apply moist heat or cold packs. Apply an ice pack to the side of your face and temple area for about 10 minutes. Do a few simple stretching exercises for your jaw (as instructed by your dentist or physical therapist). After exercising, apply a warm towel or washcloth to the side of your face for about 5 minutes. Perform this routine a few times each day. Eat soft foods. Eat soft foods such as yogurt, mashed potatoes, cottage cheese, soup, scrambled eggs, fish, cooked fruits and vegetables, beans and grains. In addition, cut foods into small pieces to decrease the amount of chewing required. Avoid hard and crunchy foods (like hard rolls, pretzels, raw carrots), chewy foods (like caramels and taffy) and thick and large foods that require your mouth to open wide to fit. Take medications. To relieve muscle pain and swelling, try nonsteroidal anti-inflammatory drugs (NSAIDs), such as aspirin or ibuprofen (Advil, Motrin, Aleve), which can be bought over-the-counter. Your dentist can prescribe higher doses of these or other NSAIDs or other drugs for pain such as narcotic analgesics. Muscle relaxants, especially for people who grind or clench their teeth, can help relax tight jaw muscles. Anti-anxiety medications can help relieve stress that is sometimes thought to aggravate TMD. Antidepressants, when used in low doses, can also help reduce or control pain. Muscle relaxants, anti-anxiety drugs and antidepressants are available by prescription only. Wear a splint or night guard. Splints and night guards are plastic mouthpieces that fit over the upper and lower teeth. They prevent the upper and lower teeth from coming together, lessening the effects of clenching or grinding the teeth. They also correct the bite by positioning the teeth in their most correct and least traumatic position. The main difference between splints and night guards is that night guards are only worn at night and splints are worn full time (24 hours a day for 7 days). Your dentist will discuss with you what type of mouth guard appliance you may need. Undergo corrective dental treatments. Replace missing teeth; use crowns, bridges or braces to balance the biting surfaces of your teeth or to correct a bite problem. Avoid extreme jaw movements. Keep yawning and chewing (especially gum or ice) to a minimum and avoid extreme jaw movements such as yelling or singing. Don't rest your chin on your hand or hold the telephone between your shoulder and ear. Practice good posture to reduce neck and facial pain. Keep your teeth slightly apart as often as you can to relieve pressure on the jaw. To control clenching or grinding during the day, place your tongue between your teeth. Learning relaxation techniques to help control muscle tension in the jaw. Ask your dentist about the need for physical therapy or massage. Consider stress reduction therapy, including biofeedback. Transcutaneous electrical nerve stimulation (TENS). This therapy uses low-level electrical currents to provide pain relief by relaxing the jaw joint and facial muscles. This treatment can be done at the dentist's office or at home. Ultrasound. Ultrasound treatment is deep heat that is applied to the TMJ to relieve soreness or improve mobility. Trigger-point injections. Pain medication or anesthesia is injected into tender facial muscles called "trigger points"" to relieve pain. Radio wave therapy. Radio waves create a low level electrical stimulation to the joint, which increases blood flow. The patient experiences relief of pain in the joint. Surgery should only be considered after all other treatment options have been tried and you are still experiencing severe, persistent pain. Because surgery is irreversible, it is wise to get a second or even third opinion from other dentists. There are three types of surgery for TMD: arthrocentesis, arthroscopy and open-joint surgery. The type of surgery needed depends on the TMD problem. Arthroscopy. Patients undergoing arthroscopic surgery first are given general anesthesia. The surgeon then makes a small incision in front of the ear and inserts a small, thin instrument that contains a lens and light. This instrument is hooked up to a video screen, allowing the surgeon to examine the TMJ and surrounding area. Depending on the cause of the TMD, the surgeon may remove inflamed tissue or realign the disc or condyle. Compared with open surgery, this surgery is less invasive, leaves less scarring, and is associated with minimal complications and a shorter recovery time. Depending on the cause of the TMD, arthroscopy may not be possible, and open-joint surgery will need to be considered. Compared with arthroscopy, open-joint surgery results in a longer healing time and there is a greater chance of scarring and nerve injury. Reviewed by the doctors at The Cleveland Clinic Department of Dentistry. Edited by Charlotte E. Grayson, MD, February 2003.